The introduction of Common Core State Standards (CCSS) has caused many literacy educators to increase their emphasis on informational texts and explore close reading techniques. To date, much of the discussion and focus of the new ELA standards has been on reading and writing, but now we are st arting to see educators turn their attention to the anchor standards for Speaking and Listening. While there are deep connections between listening and reading, the CCSS introduced separate standards specifically tied to oral language. However, it’s often a challenge to cover even more standards in the same amount of instructional time, especially when you lack appropriate curriculum. We are uniquely designed to focus on meeting speaking and listening standards integrated with a content focus, providing authentic, non-fiction audio aligned to the curriculum. 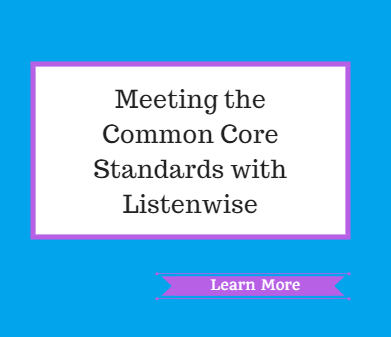 Below we describe some of the ways Listenwise can be used to address the standards. To have a rich classroom discussion you need a meaningful and relevant topic. It’s hard to have students practice collaborative discussions if they don’t care about the topic! Real-world podcasts provide engaging, authentic content for all learners, and motivate them to participate in discussions and opinion sharing. At Listenwise we pair the podcasts with instructional resources that focus on helping students express their opinions and ideas. Students are encouraged to make connections between the content in the audio and their own knowledge, expressing their ideas and engaging in discussion with other students. Integrate multiple sources of information presented in diverse formats and media (e.g., visually, quantitatively, orally) and explain how it contributes to a topic, text, or issue under study. There are multiple sources to acquire information: texts, experience, discussions, websites and media. Listenwise provides audio content aligned to curriculum that can be integrated with other sources to contribute to an understanding of the topic. Our audio stories are a great addition to what teachers are already teaching, and can be used together with texts or a classroom unit, to provide another format with authentic voices and varying perspectives. Audio provides another modality to acquire information for students who learn and remember content through various senses. Evaluate a speaker’s point of view, argument and specific claims, distinguishing claims that are supported by reasons and evidence from claims that are not. Listenwise stories often include multiple speakers who are approaching a topic from different perspectives. We provide instructional supports to aid students’ comprehension of the speakers. While the standard does not specifically mention comprehension, it is a underlying skill necessary to evaluate sophisticated arguments or language and not all secondary students have the necessary level of proficiency for college and career readiness. We also include activities for students to evaluate the purpose and point of view of speakers in the audio, and state their opinions. Students can also use evidence to support their own arguments and analyze the evidence stated by other students, agreeing and disagreeing with other students respectfully. Listenwise presents content in audio format that students can engage in and respond to. Students can use the audio to discuss and present their ideas using facts, details and evidence. The resources provided in the lessons allow students to gain significant background information on a topic, or extend their learning beyond the audio. This can support students in gathering further information to state their position and defend it with evidence. On Fridays, we showcase a current events issue that students can debate. Students are encouraged to think about both sides of an issue and then take a side, defending their statements or claims with evidence from the audio story. Listenwise provides an audio component that students can use to enhance their presentations, and help their make their points with clarity. They can cite Listenwise audio in their presentation as well as in their research as a credible news source. Listenwise helps students become familiar with reporting, journalism, and interview conventions for audio and many authentic examples of formal spoken English outside of the classroom. In order for students to be able to present oral arguments effectively they need to hear what those sound like, especially when delivered in formal English. Relevant vocabulary from the audio is defined, giving students specific, academic vocabulary to express their ideas. Students can also use these podcasts as a model to present their own news clip to the class, demonstrating understanding of the topic and a command of formal English.